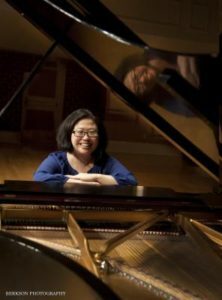 Dr. Koeun Grace Lee, Brevard College faculty pianist, will perform a program of virtuoso piano solos on Sunday, Nov. 6, at 3:00 p.m. in The Porter Center for Performing Arts’ Scott Concert Hall. The concert is free and open to the public. The program will include selected Nocturnes by Chopin, “Variations on a Theme of Paganini Book 1” by Brahms, selected Etudes by Debussy, and “Gargoyles,” Op. 29 by Lowell Liebermann. Dr. Lee joined the Brevard College music faculty this fall. She is an avid performer and educator, having performed in master classes with pianists Boaz Sharon, Jacques Després, Pascal Rogé, Jeremy Denk, Dror Biran, Joel Hastings, and André Watts. She is an active member of Asheville Area Piano Forum, Music Teachers National Association, College Music Society, and Suzuki Association of the Americas.